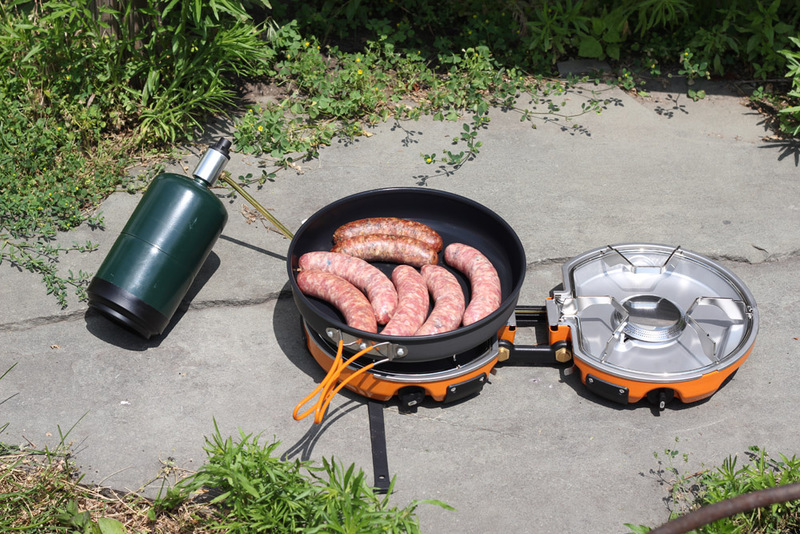 We got our hands on Jetboil’s to-be-released Genesis Base Camp Stove and let me tell you… it’s awesome. It comes to market in 2016. 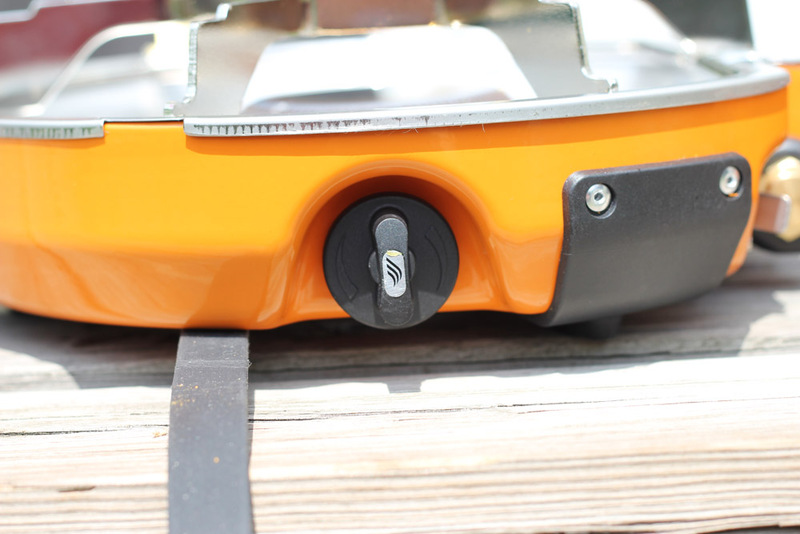 The Genesis Base Camp Stove is lighter and smaller than most car camping stoves and has exceptional flame control — more on this later. It has us looking at camp cooking in a new way. The Genesis is a two-burner stove that runs off a traditional propane cylinder. 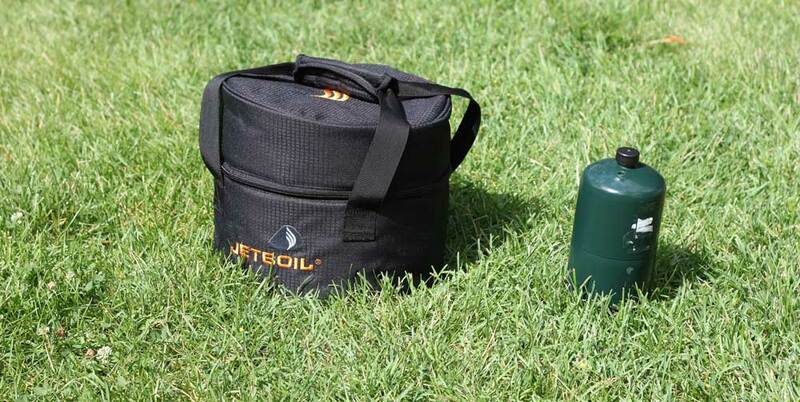 Jetboil has gone ahead and ditched the heavy metal surround that is found on most traditional camp stoves and packed them in a compact and relatively light (9 lbs, 14.5 oz) clamshell design. The two burners are capable of putting out 10,000 BTUs each. And they simmer like almost no other stove we’ve tested. 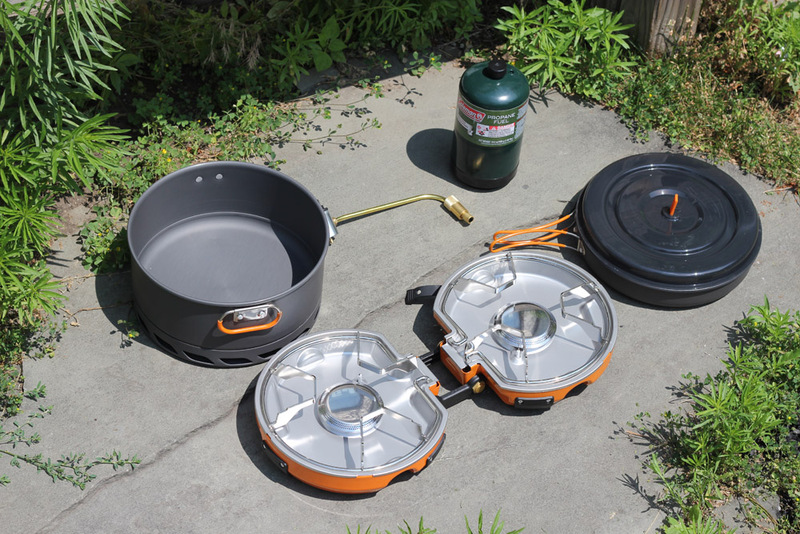 The whole system, including the 5-liter “flux ring” pot and frying pan, packs into a compact carrying case. 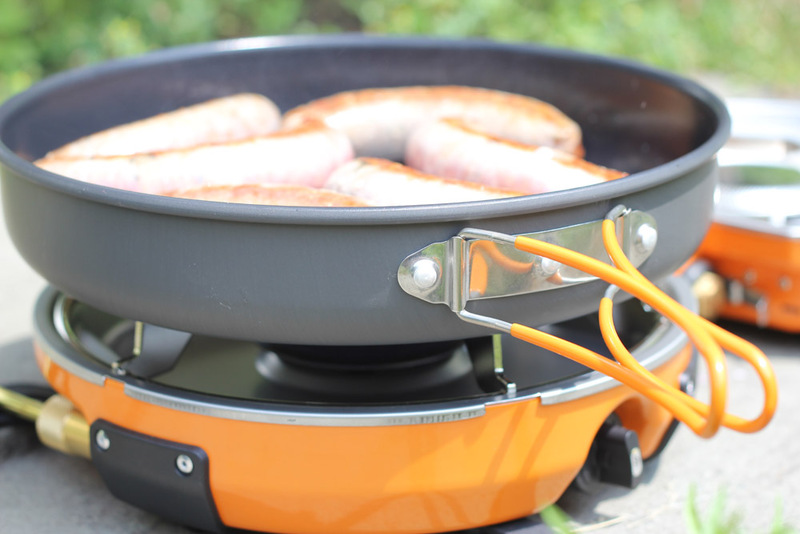 The stove system is easy to set up and was ready to cook in less than a minute. Lighting the stove is a matter of cranking open the gas valve and flipping the manual ignition switch on the side of the burner. The stove is extremely quiet, so much so that we had a hard time telling if it was lit (during the day) without holding a hand above the burner. Where the Genesis really shows through is its simmering ability. The burner knob can be spun in four full rotations from the lowest to highest setting, and each slight movement of the knob makes fractional adjustments to the flame. This thing has a better simmer than my gas stove at home. We cooked sausages and beans over the two burners and were able to regulate the heat better than any other camping stove we’ve used. No burnt brats here! 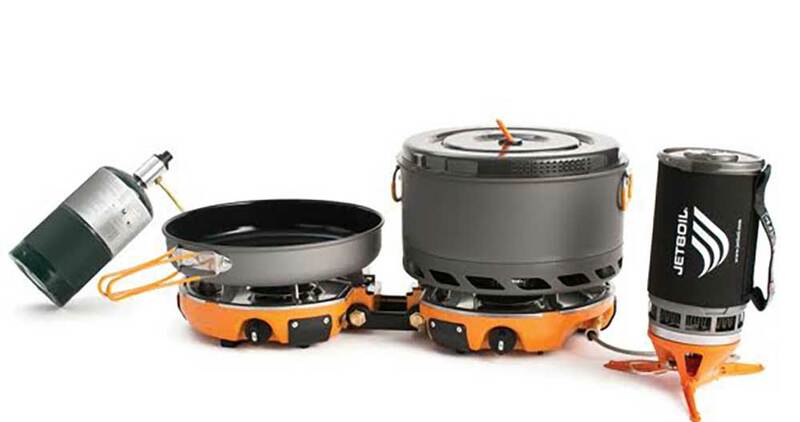 It also offers the ability to chain on an additional burner that works with a standard Jetboil pot for boiling water. You can even chain another Genesis with it, making a massive four-burner kitchen. All this awesomeness doesn’t come cheap. 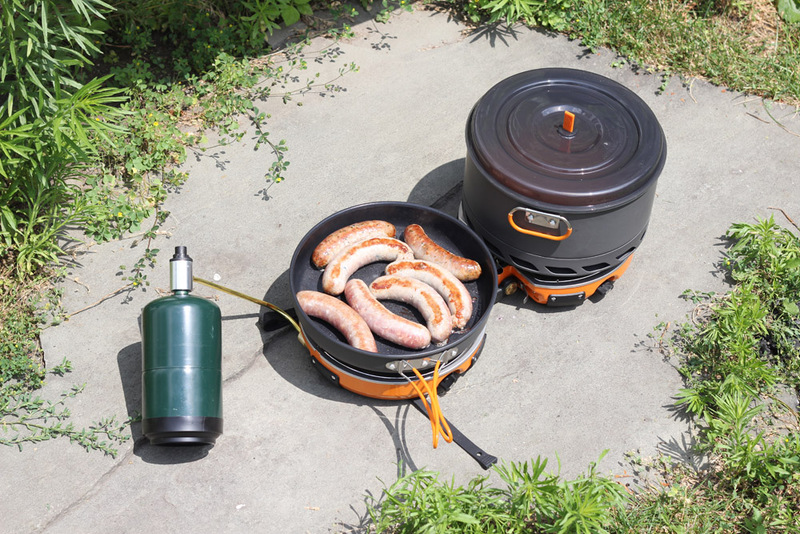 The Genesis Stove System, which includes the stove, a ceramic-coated frying pan, a 5-liter pot, a simmering cover, a propane hookup, a windscreen, and a nylon carrying case, will retail for $350 and will be available in January 2016. Note: Coleman makes a similar stove design — the PERFECTFLOW INSTASTART FOLD N GO 2-BURNER STOVE — which retails at $120. We have not tested it. You can also buy just the stove and carrying case for $240. The additional burner will cost $60. We’re looking forward to putting the Genesis to the test over the coming months but if it continues to perform as well as it did on our first test, this very well might be our favorite base camp or car-camping stove of all time.